Ten years ago there was talk of the boomers working into their seventies. The "me generation" was said to be "young at heart". This decline is notably seen in tasks that are highly mentally demanding, like speed of processing (how quickly you handle incoming information), attention, working memory (how well you manipulate and keep information active in your mind), and, of course, long term memory. The Gizmodo article, clearly written by a young chap, imagines we'll outsource our recall and declining cognition to an onboard chip (vs., say Google). Sure. While we're waiting to be chipped, however, knowledge work is becoming ever more demanding - and non-knowledge work doesn't pay too well (unless you're CEO, then non-knowledge work can pay very well). In the post-modern world, unless we can bend that decay curve (hello? dementia meds?) 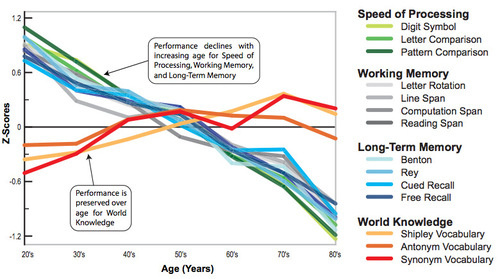 many of us will have a hard time doing competitive knowledge work into our 60s - much less our 70s. Bagging groceries yes - genomic engineering not so much. That could be a bit of an economics problem. We really should be spending more money on trying to bend that curve. We need my generation to earn money until we take our dirt bath. Interesting. I'd click the article to read it but I don't recall how. Wonder why world knowledge stays the same (or increases slightly). I wonder if, like physical exercise effects physical health, if there are studies that show how doing things to maintain the plasticity of the brain would help delay this. The only thing that really seems to slow the normal dementing process is exercise. This is weird. I didn't believe it when the human studies came out, but it seems to be borne out by animal models. So it's biologically plausible. WE don't know how it works, which is annoying. If we knew we might be able to come up with a useful drug that would do the same thing. Needless to say drug companies are interested. The other big intervention is to never do anything that might cause your head to hit something. Stay home. Walk carefully. Wear a helmet to work. Of course I don't do those things. So you'd want to exercise regularly indoors on an exercise bike wearing a helmet. Life's a beach as they say. Of course we're doomed in the end, so you take your choices. All the stuff about studying languages, doing crossword puzzles, playing bridge, etc etc is very unpersuasive. Severely deprived animals show a positive impact with "cognitive work" but knowledge workers are probably maxed out. The useful stimulus level is probably far below what most humans experience in the modern world. So don't hit your head, and exercise, and if you're 35 or older now you're probably doomed to de facto retirement at 55-60 (and subsequent starvation of course - tenured faculty and senior execs exempted). Those under 35 still have a chance of picking up some good drugs by the time they're 45.